Plants have been widely used by Native American healers, such as this Ojibwa man. Researcher Cassandra Quave at Emory University has used ethnobotany to address the problems that arise from antibiotic resistance. Quave notes that the advantage of medical ethnobotany over Western medicine rests in the difference in mechanism. For example, elmleaf blackberry extract focuses instead on the prevention of bacterial collaboration as opposed to directly exterminating them. Many instances of gender bias have occurred in ethnobotany, creating the risk of drawing erroneous conclusions. Anthropologists would often consult with primarily men. In Las Pavas, a small farming community in Panama, anthropologists drew conclusions about the entire community's use of plant from their conversations and lessons with mostly men. They consulted with 40 families, but the women only participated rarely in interviews and never joined them in the field. Due to the division of labor, the knowledge of wild plants for food, medicine, and fibers, among others, was left out of the picture, resulting in a distorted view of which plants were actually important to them. Ethnobotanists have also assumed that ownership of a resource means familiarity with that resource. In some societies women are excluded from owning land, while being the ones who work it. Inaccurate data can come from interviewing only the owners. Other issues include ethical concerns regarding interactions with indigenous populations, and the International Society of Ethnobiology has created a code of ethics to guide researchers. ^ "Ethnobotany". www.fs.fed.us. Retrieved 2 May 2018. ^ a b "Ethnobotany". www.eplantscience.com. Retrieved 2 May 2018. ^ Kandell, Jonathan (13 April 2001). "Richard E. Schultes, 86, Dies; Trailblazing Authority on Hallucinogenic Plants". The New York Times. The New York Times Company. Retrieved 2 May 2018. ^ Kochhar, S. L. (2016). Economic Botany: A Comprehensive Study (5 ed.). Cambridge University. p. 644. ISBN 9781316675397. ^ Soejarto, D.D. ; Fong, H.H.S. ; Tan, G.T. ; Zhang, H.J. ; Ma, C.Y. ; Franzblau, S.G.; Gyllenhaal, C.; Riley, M.C. ; Kadushin, M.R. ; Pezzuto, J.M. ; Xuan, L.T. ; Hiep, N.T. ; Hung, N.V.; Vu, B.M. ; Loc, P.K. ; Dac, L.X. ; Binh, L.T. ; Chien, N.Q. ; Hai, N.V.; Bich, T.Q. ; Cuong, N.M.; Southavong, B.; Sydara, K.; Bouamanivong, S.; Ly, H.M.; Thuy, T.V. ; Rose, W.C.; Dietzman, G.R. (2005). "Ethnobotany/ethnopharmacology and mass bioprospecting: Issues on intellectual property and benefit-sharing" (PDF). Journal of Ethnopharmacology. 100 (1–2): 15–22. doi:10.1016/j.jep.2005.05.031. PMID 15993554. ^ a b White, James T. (1931). The National cyclopædia of American biography ... v.21. University of Michigan. ^ Ponman, Bussmann, Bruce E, Rainer W. (2012). Medicinal Plants and the Legacy of Richard E. Schultes (PDF). Missouri Botanical Garden. ISBN 978-0984841523. ^ Mazal, Otto. "Dioscorides: De Materia Medica". Uchicago.edu. University of Chicago. Retrieved 2 May 2018. ^ "The Columbian Exchange, Native Americans and the Land, Nature Transformed, TeacherServe, National Humanities Center". nationalhumanitiescenter.org. National Humanities Center. Retrieved 2 May 2018. ^ "Sitka spruce". www.for.gov.bc.ca. British Columbia. Retrieved 2 May 2018. ^ Han F. Vermeulen (2015). Before Boas: The Genesis of Ethnography and Ethnology in the German Enlightenment Critical Studies in the History of Anthropology Series. University of Nebraska Press. ISBN 9780803277380. ^ G.E. Wickens (2012). Economic Botany: Principles and Practices (illustrated ed.). Springer Science & Business Media. p. 8. ISBN 9789401009690. ^ Andrea Pieroni, Cassandra L. Quave, ed. (2014). Ethnobotany and Biocultural Diversities in the Balkans: Perspectives on Sustainable Rural Development and Reconciliation (illustrated ed.). Springer. p. 1. ISBN 9781493914920. ^ The Shaman's Apprentice Forest. South American Explorer, Autumn 1988. ^ Sood, S.K., Nath, R. and Kalia, D.C. 2001. Ethnobotany of Cold Desert Tribes of Lahoul-Spiti (N.W. Himalaya). Deep Publications, New Delhi. ^ "American Indian Culture and Research Journal". 20 (2). American Indian Culture and Research Center, University of California. 1996: 213. ^ Herrick, J. W. (1995). Iroquois Medical Botany. Syracuse, NY: Syracuse University Press. ^ "Could Ancient Remedies Hold the Answer to the Looming Antibiotics Crisis?". Retrieved 2018-10-26. ^ Howard, Patricia. "Gender Bias in Ethnobotany: Propositions and Evidence of a Distorted Science and Promises of a Brighter Future". academia.edu. 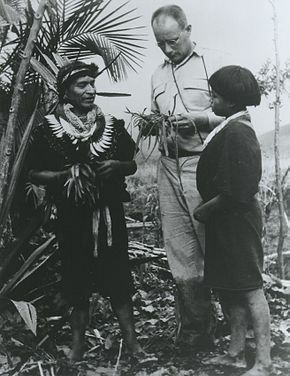 ^ "Gender bias in ethnobotany -- a legacy and process". TeachEthnobotany. 2 July 2013 – via YouTube. ^ Jeanine M. Pfeiffer; Ramona J. Butz (2005). "Assessing Cultural And Ecological Variation In Ethnobiological Research: The Importance Of Gender". Journal of Ethnobiology. San Jose State University. 25 (2): 240–278. doi:10.2993/0278-0771(2005)25[240:ACAEVI]2.0.CO;2. ^ "The ISE Code of Ethics - International Society of Ethnobiology". ethnobiology.net. Retrieved 2 May 2018.